Yesssss, finally, i was waiting for this but didn't want to spam the journal, as i was sure you have it in mind all the time. Amazing to be back up there man, what a damn beast and motivation you are!!!!!! thanks. this time around, i got the paused 475 at a no-very-fat 206-208lb. i was 210+ before. the backoff 405x2-3s are paying off. probably need to do a lot of 2-3 paused reps on 435 if i were to have a chance at 495. * felt a little stronger than yesterday but not very strong yet. might stay with 455 later this afternoon. vid of most recent 475 this monday or latest tuesday. * been feeling under the weather for 1.5 days now. dehydrated a little and feeling tired. got very good sleep this afternoon thats why i was able to maintain my routine. no 475 when i'm not thick. will start eating better when i recover from the colds. very cold SF temps in the last few days. * skipped the 455 this morning for better recovery. i could have gotten it but it will be a fight. still recovering from the colds. will do better later. * been sleeping a lot. bw still dropped 5+lbs from the colds. not 100% but getting better. still have little appetite. dropped the one arm rowing from 90 to 80. * feeling a little better than yesterday so i went for the 455 top set. still not 100% until the end of the week. i probably lowered my immune system getting excited and doing so many 475s last week. little cold virus did damage. will get more sleep. took some days off work. can't be inside cleanroom anyway with the colds. * will start work tonight and this is only 1 day of work this week. took 2 days vacation on a 3-day week. bw doing well again. not dehydrated and feeling a lot better now. * not sick anymore. desperately need to add some backoff sets on the squats. * too cold this morning. did not feel like fighting a 455. will save it for later. week 16 now of daily 455s. feeling good about this. will add some 405s after the 455 this afternoon. * will continue with the 405x3s and take them off to peak again for another shot at the 475s. * another 30s cold SF morning. did not matter. came in with sweat pants and long sleeves. legs primed nicely with the 405x3 12hrs ago. kept it at 405x2 so i dont burn out. * building fatigue on the squats but not fast enough to not recover. adding volumes of double arm rowing because i already forgot how comfortable this movement feels on the chest press machine. my feet are planted against the back rest and i sit on a 24" box in front of machine. working 4-nights this week. Cardio - Inclined Walking 2.5mph at 7.5% 15mins HR 112bpm. * some little muscle in my inner left hip a little off from pushing heavy cryogenic tanks at work. walking normal if my strides are shorter. did the same when i squat. shorter steps and everything is cool. did 15mins of walking to loosen up and get rid of this anomaly. nothing injured or serious. * hips normal again. don't like that feeling of something little hurting in the inner hip area. can't massage it. makes walking very awkward. * did more walking because it feels good. i already do a lot of walking at work but can't go wrong with more walking. i dont sweat at this snail pace. Cardio - Inclined Walking 2.5mph at 7.5% 15mins HR 115bpm. * could have gotten a 475 but i stayed with the plan of consistent volumes. felt like i could have done 7 paused reps of 405. i did not tire much. will get 405x2 tmrw morning. * felt the fatigue from the 405x5 but it was not enough to skip the 405x2. i was planning on doing a backoff 60lb x20 on the one arm rowing but my grip called it at 15. * back to back very strong afternoon. i changed my mind. i went for the 475 instead of more planned 405 backoff volumes and it looked like on vid that i could have done 495. will upload later. * took wed night off at work next week. will not work til thur night. did many things for the pushing this afternoon. ya the hip stuff always freaks me out too. like you said, can't really get to it. that alone makes it more scary, because it can feel more like a joint issue. "did more walking because it feels good. i already do a lot of walking at work but can't go wrong with more walking." * strong already on a sunday morning. * did not feel any stronger this afternoon. pressing feeling very good. 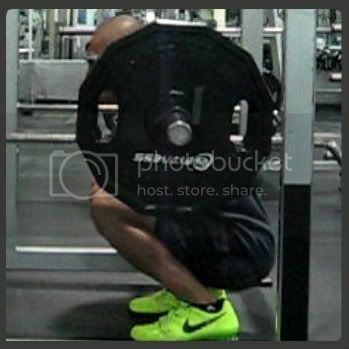 * squats did not feel that much tired from yesterdays 405x5. smith tricep bench pressing feels a lot better for my front delts. i'm just afraid of the bar slipping from my grip and crushing me. * 475 got up again smoothly and no sticking point. thinking now that my top single could be heavier. don't know how to ramp up to a 485-495. if i go thru 405-440-485, i might get too tired already but will give it a try next time i feel this good. * took whole week of work out due to family matters. skipped the morning. one of the very rare times that i don't lift after waking up. did not screw up my afternoon coordination. the afternoon felt the same as yesterday. * did not get good midday sleep. im sure it has something to do with my work rhythm. i did not stay awake for 13+hrs and my body is so used to that now. i barely got 4hrs of daytime sleep. * still not getting longer sleep at days. been awhile since i slept more than 5hr straight. its been on and off 3-4hrs. i don't feel tired but i don't feel very strong either. * im due for a straight 5+hr daytime sleep soon. im better off just working and sticking with my routine. this feels weird. things were out of my control. had to adjust last week and the following week. * got 3+4hrs sleep with about 1.5hr in between for an errand. not the best kind of daytime sleep but i was still very strong on the afternoon. * got almost 5hr sleep at night an felt very strong already. the 475 did not have a sticking point and was from a solid pause. if i can do another 475 later, then i'm really getting close to the 495. * another strong morning workout. my tricep bench press is up to 275x5s now. not very long til i go for the 315 here. * thought id be stronger this afternoon after sleeping well. no. tired. probably the volumes of benching, or its a saturday thing. * its been 20 weeks already since i started doing daily 455 top single. 475#22 at a different 24hr on sunday. new platform. felt good here. beast as fu*k. that new gym has a nice angle with the lighting. has your stance gotten even closer or is it just the angle? Def beastin' with that squat, it looked comfortable. I was gonna mention the same thing too. Your feet are quite narrower than shoulder width, probably hip width. is it problematic for the hips if you do wider stance. just the angle. i try to do shoulder width or less. if i go wider, i get lower and wreck my lower back. * using the 1RM calculators, 405x7=486, 405x8=503. if i can daily a 405x5 without a sticking point on the 5th rep, im most likely thick enough to peak to a 405x7-8 reps. my plan is to try 495x1 when im thick for daily 405x7s. or i just fukit and try later. the 475 this morning was easy. * did not have a sticking point on the paused 495lb. not the strictest of pause. video looks shady. looked like i added plates after the rep. its ok. il get this again. * still feeling very strong. might go for 495 later again. * only did squats this afternoon because of schedule. squats felt stronger than yesterday. * rare thur morning workout because i took a day off from work. will only do 2-nights work this week. would be nice to get 495 again later before i take it easy again. * still weak. probably weak also this afternoon. body adjusting to worknights and getting my sleep rhythm back slowly. weak is relative. the 455 was easy. im just feeling not strong because im coming down from 495s now. * sleep pattern is adjusting. was awake till 12 noon and only slept til 4:30ish. * did not sleep well during the day. did some errands and was not able to get back to my rhythm. still stronger than the last few days but need better sleep. il get that tonight and tomorrow. * feeling stronger this morning. * big difference when i sleep well. i could have added 10-15lbs more but will stay with the 495. * same as yesterday morning. if get good sleep, il do the same in the afternoon too like yesterday. * sleep sucked. did not get 6hr+. family thing. will try again tmrw. took day off work. * got better sleep than yesterday afternoon. felt good and strong. like yesterday morning. will get good sleep later. * working now til sat night. will not be strong again until monday next week.